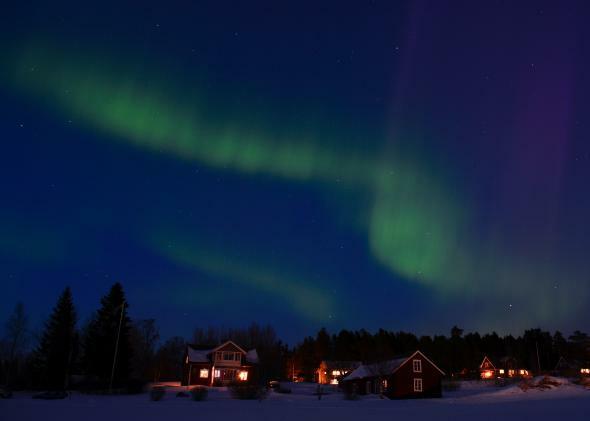 The aurora borealis bright up the sky on March 17, 2013, between the towns of Are and Ostersund, Sweden. The National Oceanic and Atmospheric Administration’s Space Weather Prediction Center (SWPC) held a rare Tuesday afternoon press conference to announce the storm’s arrival and expected impacts. “Today we are experiencing a severe geomagnetic storm,” Tom Berger, director of the SWPC said. Tuesday’s storm ranks in as a G4 storm, the second strongest in the five-tier level for ranking geomagnetic storms. Bob Rutledge, the lead space weather forecaster at the SWPC said a storm of this magnitude is “a bit unusual in the current solar cycle,” only the second G4 storm in the last decade. The last one that was stronger was in August of 2005. The current storm is being produced as a result of two magnetic eruptions on the sun’s surface Sunday morning, which sent charged particles towards the Earth at millions of miles per hour and are now exciting our planet’s magnetic field. This particular storm isn’t expected to result in any fluctuations of the power grid or satellite abnormalities, so you can enjoy the northern lights without worrying about a massive civilization-crippling continent-scale blackout. The northern lights could be visible much farther south than normal. 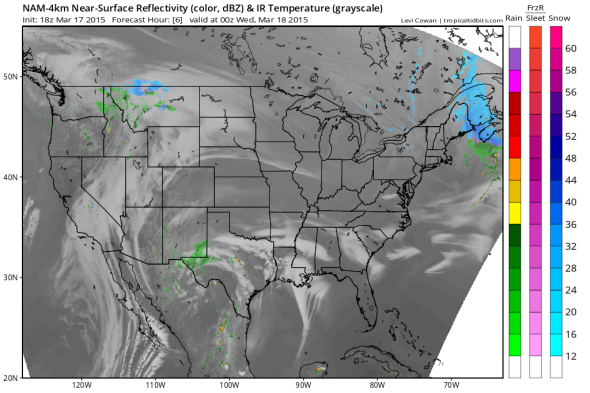 At its current intensity, San Francisco, Dallas, and Atlanta could see a glimpse—even as far south as northern Florida. If you live north of those cities (which is most of America), you’ll stand a better chance. Oh by the way, Ireland will also get a chance for some extra greening o’ the sky. The northern lights are best visible around midnight local time—with the sun at its peak height in the sky on the other side of the planet. Plan to head outside around then. Unlike watching a solar eclipse (which can permanently damage your retina without proper eyewear), you don’t need any special equipment to watch the aurora. Just go outside, point your body toward the north, and look up. How will I know if what I’m seeing is actually the northern lights? If the aurora isn’t very active, you may only see a faint green glow just above the horizon—it’s easy to confuse with light pollution from a nearby city. The key difference is the aurora will be gradually morphing over time. If you set up a long-duration exposure on your camera (at least 30 seconds), you may notice faint pillars of green emanating upwards from the horizon. That’s the aurora. If you’re lucky, or live a bit further north, the aurora may appear as vertically oriented greenish-gray streaks in the sky. If you’re really lucky, it’ll be obvious (and breathtaking) that what you’re seeing is the northern lights—the continuously changing pillars of greens (oxygen) and reds (neon) and purples (argon) are caused by high-energy particles from the sun tunneling into the Earth’s upper atmosphere. Slate’s resident astronomer Phil Plait recently wrote a full aurora explainer. Before you go outside, check NOAA’s real-time aurora forecast, which will give you a 30-minute heads up on northern lights activity. And if it’s cloudy where you are tonight, you can watch pictures stream in continuously at SpaceWeather.com. 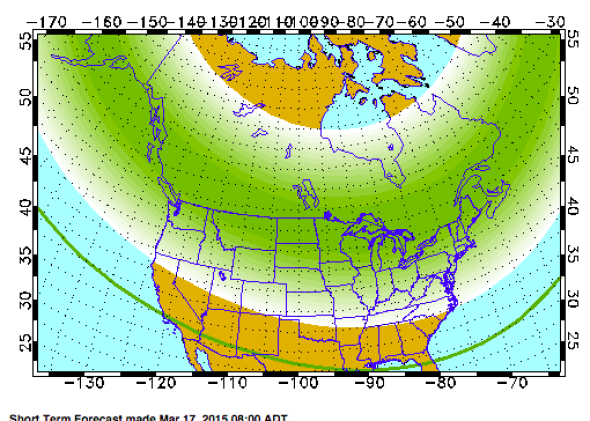 The country will be relatively cloud-free tonight east of the Mississippi, so the solar storm has good timing. Tuesday night’s expected cloud cover could interfere with views of the Northern Lights for parts of the West, as well as Texas to Georgia.